Cakewalk has launched a Cakewalk-only MySpace page for their users. It’s a blend of commercial endeavor and community site. On the commercial side, there’s a fair amount of advertising of Cakewalk products and the Cakewalk tour. That to me is overkill, since usually the most passionate advertising comes from your users. But there are some community features: featured music by Cakewalk users, contests, and of course, a massive network of Cakewalk friends (some of whom are pictured below). So, knowing how loyal some of you are to your software, have at it, Cakewalk superfans. Oh, and don’t miss this vintage Cakewalk ad. “Cakewalk LIVE!” loads whole song sets and switches from one to another without delay? Hmmm, there are a few apps now I wish did that. 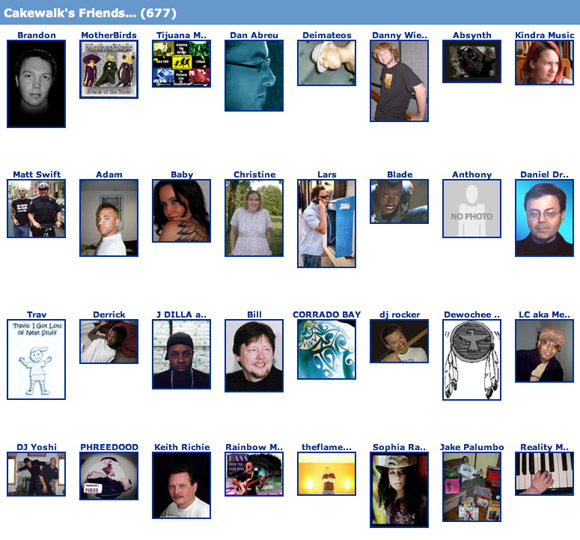 MySpace in this case is networking-only, since there are already official and unofficial Cakewalk forums out there. In other news, I’m fairly certain this is not the Cakewalk software page. MySpace has started up some discussions on the CDM Forums. Some of you love it; some of you hate it. (See the CDMers on MySpace thread.) But many of you are there, and, of course, we encourage you to share your pages on our forums. So, should other apps do this, too? (Perhaps led by users rather than the software makers?) And should I fire up a CDM MySpace page? Will the MySpace phenomenon really continue?